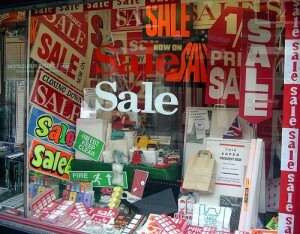 The Psychology of a Sale » Embroidery Talk Has Moved! I see them every month. In truth, I used to create them every month. I suppose almost every online store does it, and I suppose most customers are accustomed to seeing a variety of e-mails from various online stores advertising their various sale items on a monthly basis. Everyone puts stuff on sale. It’s part of selling. These days, if you see an e-mail from EnMart, it won’t be announcing a sale. The fact is our regular prices are, in many cases, lower or equal to the sale prices that others offer. I’m not saying that is always the case, or that I’ve looked at absolutely every site out there, but I will say that among those I have seen, our prices are often the lowest. Having a sale on something that is already very reasonably priced seems a bit like gilding the lily. I also don’t want anyone to suppose that low prices means shoddy or low quality merchandise. We are able to offer the prices we offer because we have a very well connected purchasing team. They’ve been around the business for a number of years and know just about everyone. These relationships and connections allow us to get great prices. Because the prices we are charged are reasonable, we are able to pass those savings on to you. So, it isn’t likely you will ever see a sale e-mail from EnMart. We do offer specials on occasion, often when we get a really good price on something which we can pass along to you. EnMart will also offer closeout pricing when we’re phasing a particular product out of our inventory. We also offer combo packages and volume discounts which can help you save even more money. Our goal, always, is to offer you the best merchandise at the best prices. This entry was posted on Wednesday, December 23rd, 2009 at 11:42 am and is filed under Shop EnMart. You can follow any responses to this entry through the RSS 2.0 feed. Both comments and pings are currently closed.